Hello everyone! I said I would start doing more "basics" videos this year and I wanted to kick-start that trend with one of the most highly requested videos, a "how to apply BB Cream" tutorial. I was actually surprised to see that so many of you wanted to see this, but like with foundation, the texture of the product has a lot of impact on how best to apply it. My technique is actually a bit different than how I apply foundation so here's a step-by-step look at how I prefer applying BB Cream. So for those of you new to "bb cream", they are Asia's answer to an all-in-one tinted moisturizer. They give a natural coverage while giving additional benefits like sun protection, anti-aging properties, evening skin discoloration, and help to heal blemishes and unbalanced skin. I do have an overview review and post of several different kinds which you can check out here. I also added some of my favorite natural blush, Tarte Exposed, as well as a bit of Urban Decay Naked lipstick to get the final face that is fresh, glowy, and perfect for everyday. Let me know in the comments what you'd like to see in the next "basics" video! Nice tutorial. Now if only I had some BB cream to apply...Time to hit the stores, I suppose. I gave my BB Cream another go (the Skin79 hot pink one) but by lunch time it had mostly slipped off my skin, even with a finishing powder. Any tips to keep it on longer? I know. That has happened to me, too. It runs off my face and into my hands. I handle a lot of paperwork at my job and I would see my fingerprint on the paper. I don't want to send paperwork with my fingerprint on it. I stopped using VB cream because of this. I meant bb cream, not VB cream. I love the finish the BB creams give and the easy of application. I just have really oily skin. I use both the Skin 79 hot pink and gold BB creams - but by mid-day they start to slide off my face. I've used setting powders and primers but still not much more luck. who's the little furry guy sashaying across the room? we haven't been introduced! Thank you for making this video! I watched yesterday and immediately pulled out my Skin 79 pink B cream, took off my makeup and applied w/ my fingers. When I first got it I used a brush like I do for foundation and it was just OK. Fingers is so much better! I used it again today! Ooooh this is super useful! I'm trying to learn as much as I can about bb creams so this really helps. Do you know if there are any Asian moisturising creams out there that have the same skin rejuvenating, pore tightening and skin whitening effects? Basically a bb cream that is actually a moisturiser and doesn't need to be removed at the end of the day? I've never used foundation before, so I am a little reluctant to leave products on my face for the whole day...! And for the future...any tips on how to remove blackheads and whiteheads? Hmmm video ideas...how to achieve a no make-up applied look? Thanks for posting this video! Such a great tip to use BB cream as a layering product. I have watched your previous video about different types of BB cream. I'm currently using Missha but have just ordered the Skin 79 Super Hot Pink. Such a great review on BB cream swatches. Save me from buying a whole bunch and test them out. I just did a blog on BB creams too!! I use Missha Perfect M in 31 coz I have tanned skin. Know of any other brands that make them for tanned skin? Do you feel that BB creams tend to smudge very easily???? Yes! I hate it! I know you're asking Jen, but just thought I let you know you're not the only one who experienced that with bb cream. See my reply above to another blogger. I just stopped using bb cream I like how it makes your face feel, like it's light, anti-aging, smooth, but it rubs off and into my hand! I constantly have to go to the bathroom or check the mirror. Makes my face feel gross at the end of the day. I was wondering if you could do a basic video on how to contour your face? (I have a much wider face than you) so any advice on how to make my face look skinnier would be great! Thank you for posting this. I have just recently started using BB creams and could never get it to work properly for me. I will try the method you shared and see if that gives me better results! Thanks for the video! I have Missha Perfect Cover and for some reason I just cannot sweep it all over my face like you did - on most days it just rubs right off no matter how light-handed I was! Ended up having to pat it on from the start. haha...Love this vid Jen, like all your others. I use my bb cream in the same way you do :) only I don't apply it all over. Only on my blemishes and for brightening my under eye circles..so I totally understand you! I use vichy fluid foundation for my t-zone. Hi Jen! Thanks for doing this tutorial. =) Can you do a tutorial on how to achieve a perfect cat eye? Great video! I LOVE the hot pink BB cream. I use it everyday as my basic foundation, and then I spot conceal with Mac concealer and finish with Mac blotting powder. I love how moisturizing the BB cream is, and I really think that it has improved my skin. Jen, do you reply at all? I have sent you questions, and I'm sure many other people have, but you never answer back. I am so looking forward to your basic makeup series! Love the BB cream tutorial, I have been using it for 2 years and love it. I'm super new to BB creams, but really see their potential. Where can I get the cheapest BB creams? Great tutorial I recently bought some Skin 79 bb cream so thanks for the tips! Unfortunately I don't own BB Creams yet but I will buy some the next time being in japan, which will be in some weeks. Thanks for the basic technique in applying bb cream. A quick question, does anyone know what that pink clip on Jen's hair is called? I've seen many people use it to pull their side bangs aside when doing make-up. Thanks for this!! BTW, what brush is that you are using? Thanks!! How to take care of your false eyelashes so they last longer! Thanks for the BB cream tutorial! It's definitely my go-to product in the morning. Maybe a future basics tutorial on contouring the face with bronzers and highlighter/luminizers would be helpful. Maybe even one on how to select the right undereye concealer, too! Thanks again! I was wondering if you've actually tried any of the American bb creams? are there any that are similar to the Asian ones? On a less related note, do you have any tips for applying tinted moisturizer? Your wavy hair looks great. How do you style it? love the hot pink skin79 one <3 it does wonders! I wish to see on ur next basic video on ur favorite brushes. Could you show us what are good brushes we should own ? Thank you Jen !! Loving your videos, so helpful ! and by the way, ur link to where we could buy this bb cream is out of stock, any recommendation where we could get this cream other than ur linked website ? Hi jen! Another reader frm singapore! I have really sensitive skin that turns red and fleshy after applying all kinds of make up! Do u have any trick to calm my skin? And im gng overseas too! Anyway i can keep my skin moisturizer on the plane? I love BB cream. Great tutorial. Hello Jen. Your tutorials are a great help for me. Thank you. I am your new follower. How did you do your eye makeup here? I LOVE IT!! Teach me please!! i love your earrings, where are they from? thansk! Just placed my order (ordered thru Amazon, was slightly cheaper). Can't wait to try it out!! I used Bare Minerals for years, and since your CVS clearance haul video have been using Physician's Formula powder foundation. I am totally psyched to try BB cream... I have never even heard of it before!!! Great video Jen! Love the mirror you applied your makeup wide. Where did you get it? This was actually really interesting - I think Sephora just recently introduced BB Creams into their repertoire - do you like any of the ones they carry? I love your blog, I'm semi-new to it and I don't think I've ever commented. You're adorable. I just ordered the BB cream. And the Tarte Smooth Operator. And the Tarte Blush in Blissful. The first two have been on my wish list for a while. I threw in the blush to get the free shipping, LOL. I can't wait for everything to get here. Has anyone tried the Maybelliine BB Mousse? It oxidizes REALLY quickly! Just a few seconds out of the tube it turns from a light beige color to a dark orange color. At the end of the day my face looks so dark and yellow. I hate it. I also recently bought my first Korean BB Cream! Yay :) But I have a question about it. There is a date on the BB Cream, but I don't know if it's the expiration or production date. Because if it's the expiration date, then I should go and exchange the product... But if it's the production date, then it's pretty fresh. Do you know if Korean products typically put expiration dates or production dates on their products? Hi Jen. Where did you get that cute hair clip? Thank you. I am really interested in getting this BB cream. I'm Asian like you but quite tan, I use MAC foundation 42 so I'm wondering if this would be too light for me? Thanks for all your detailed reviews and tutorials! I'd love to try a BB cream, but I'm a little worried about the whitening ingredients that seem to be in most of them. I want my skin to stay brown. Have you seen your skin get lighter after using these products (and did it last)? Jen, can you do a "basic" tutorial on removing makeup thoroughly? I've used all kinds of removers and I always feel like there are residual eye makeup leftover in the morning. Plus I feel like I have to rub and wipe w cotton pads so much to get mascara to budge even a tiny bit. So frustrating that removing makeup has to result in creating more fine lines around sensitive skin area with all that tugging and wiping. I live in Singapore and because the weather is always humid, my t-zone tends to get a bit oily. Btw, i absolutely love your blog and videos! Thanks!!! Hi .. Your blog is lovely and so are you! Congratulations We have featured this lovely blog in our FanPage, SKIN79, Brunei. Hi Jen! I just bought this and love it! Was a little wierded out with the grey-ness of it at first but it eventually oxidized and matched my skin nicely. Now i can't wait to try the hot pink one! Quick question: can you do a tutorial of how you did your hair in this video? It's so pretty!! I love your complexion....i've never heard of bb cream and would really like to try it. I live in Houston, tx where can i buy it? Thanks Jen for your post. I have found your technique is really helpful for applying skin79. Could you please make a vid on how to apply concealer or choosing the right concealer? I always had those ugly creases when I tried to use concealer. But if it's common for concealer instead of concealing but enhancing the crease, I would decide to give it up for good. Moreover now there are new skin79 orange label and skin79 BB snail creams, could you please also review those as well? BB cream by patting motion. This will prevent the fine lines and wrinkles as dragging motion may strain the sensitive skin especially around eye area. I want to try skin79 hot pink bb cream... Anyone knows a reliable website that I can buy from? Hello - I would like to ask a question about a recent purchase of Skin79 BB cream - although - I see that questions posted on here will go unanswered by the creator of this blog. So - maybe another "poster" can help with an answer. I am wondering if BB creams have an expiration date? Underneath the Skin79 BB cream bottle it has the numbers 20120420. I "assume" this number is an expiration date of 04-20-2012. I recently bought it of Amazon for cheap. And now I may know why. But - before I contact the seller - I just wanted to see if my assumptions were valid. The date listed on most Korean cosmetics tend to be the manufacturing date, not the expiration date like Western cosmetics. Since BB Cream is similar to foundation, it would be safe to stick to a 1-year rule. It uses a pump dispenser so it should be more sanitary than a lot of foundations but 1 year is an easy rule-of-thumb to remember. my face is dry even though i wash and moisturize daily before putting on bb cream. But my face still gets flaky afterward. what to do? any tips? Do you know where I could get an authentic bb cream? I just bought a sample from amazon after reading positive reviews but they turned out brown....like foundation. the oriental and vital bb creams were really runny. but basically they were a brownish color and didnt have a grayish tint at all...I didn't think they were authentic samples. 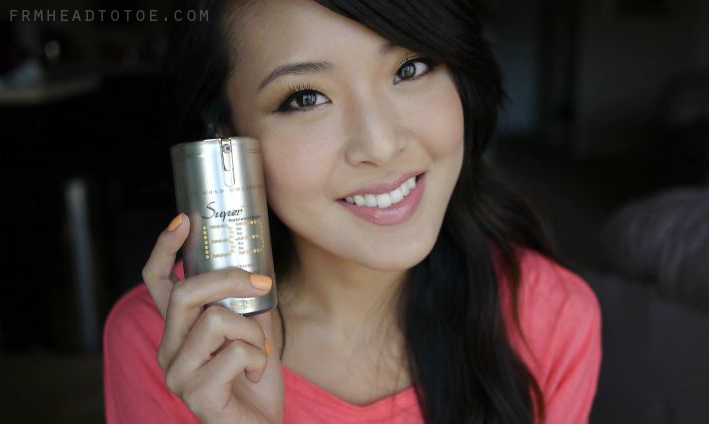 Hi Jen, Can you do a review on skin79 orange vita bb cream? I LOVE BB Cream btu I've not tried this particular one! Always thought it might be a bit too rich- how do you find it?? I would love to see a basics tutorial on selecting the best foundation type (i.e. liquid, minerals, powder, bb cream, etc) depending on skin type (oily/dry), weather/seasons, skin complications (i.e. eczema, coverage), and look (i.e. matte, dewy, etc). Every time I walk into Sephora and MAC I am overwhelmed by the choice, and I think others would find it very helpful as well. Thank you! And I hope all is well. Thank you for the demonstration, I found it on youtube after I had purchased this product and there was actually no directions on the packaging. What a great demonstration and this is also my new favorite product, it makes my skin look amazing and soft. Which is your favorite BB cream currently?